Who said domes can’t match with deluxe hotels! 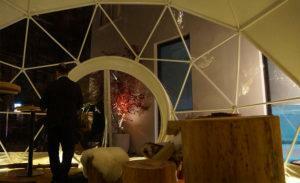 Classic 30 dome becomes a vibrant chill-out zone for a boutique hotel in Berlin, uniquely blending classic mountain cottage style with hi-tech functionality. Situated in the diplomatic area of the German capital, Das Stue is one of those upscale hotels hosting notables and celebrities alongside winning major design prizes. This unique 79-room establishment set in the former Royal Danish embassy couples traditional architecture from the early 20th century with modern Potsdam-based design from Axthelm Architects. 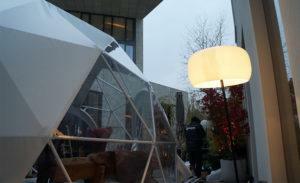 Das Stue adapted Classic 30 dome into a chill-out lounge for their guests. 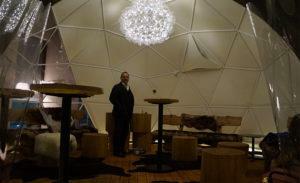 Just like in case of its own design, the hotel decided on the mix of modern and classic style for dome’s interior. The 30 square meters structure with transparent front section was transformed into a luxury mountain cabin with lush carpets and cushions, furry blankets and unfinished wood furniture. Hotel guests could indulge in a relaxing atmosphere amid inviting décor, soothing music and soft candle light. Classic dome for Das Stue shows how hotels can use F.Domes in an inventive and inviting way as areas of interaction, socializing and relax.